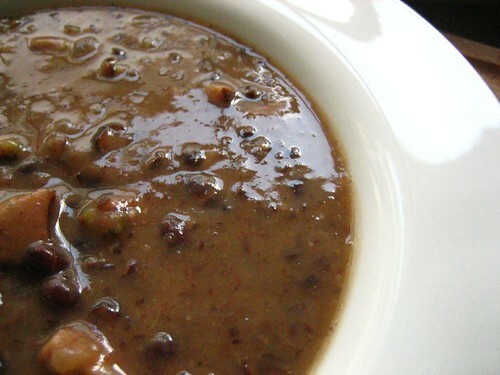 We were sans-garnish tonight, but I still loved this soup plain (like I always do)! Soak the beans overnight, or boil them in 6 cups of water for 5 minutes then cover and remove from heat for an hour. It’s 1 cup of dry black beans. Bring all that to the boil, then reduce the heat and simmer away the afternoon (about 2 hours). I add some diced turkey sausage at the end for added heft and protein. You could go completely veg if you wanted (replace the Chicken stock with Veg stock). Garnish with a dollop of sour cream, grated Colby-Jack and fresh Cilantro leaves. I ate 3 bowls of this stuff tonight. I’m sick with delight. Risotto is a nice, warm blanket. 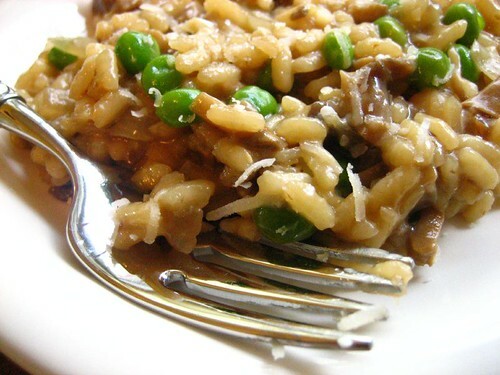 This risotto was smokey, almost beefy from the Porcini mushrooms. I boiled 6 cups of low sodium chicken broth, and once it came to the boil, I added 1/2 cup dried Porcini mushrooms and reduced the heat to a simmer. In my heavy bottom stock pot, I add 1/4 cup unsalted butter and 2 tblsp. olive oil. 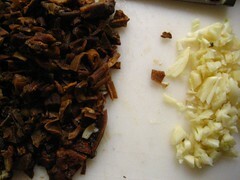 To that add 2 cups chopped yellow onion and cook until translucent (about 8 minutes). When the onions are ready, add 10 oz. finely chopped white button mushrooms, 2 finely chopped cloves of garlic and the rehydrated Porcini’s, again, finely chooped (spoon them out of the broth). Cook this for about 5 minutes. Next, add 1 1/2 cups arborio rice to toast for a bit. The kernels will start to go ghostly. Add 2/3 cup dry white wine and stir constantly until the mixture goes dry (about 2 minutes). Then start adding the broth in 1 cup ladles. Add a ladle and stir, stir, stir until the mixture starts to dry out. The rice is absorbing the broth. Keep adding broth and taste after the third ladle. I like the rice firm but not mushy. I stop adding when the rice is just al dente (it will keep cooking and softening). At the end I add 3/4 peas and 2/3 grated Parmesan. I’ve been making meatloaf for years. It was always my favorite growing up, but until now I’ve always made my meatloaf in the oven. Never again. Before I tell you how I made it, I’ll share with you my inspiration. Back in March, I tried Herbsaint for the first time. I’ve been back twice (with Bridget), and both times we ordered the meatloaf (partly because it’s delicious, but to also figure out what was in it and how to make it ourselves). We got close. I throw all of this in a large bowl, and mix it with my hands until well combined. The pancetta adds a baconiness that brings me back to my childhood, and the carrots sweeten the entire dish. I needed to cook this on the grill, so I form it into a loaf and placed it in my vegetable grill tray. Next, I lit the grill and tossed some smoke chips on top of the coals. The loaf went in and the lid went on for about 2 hours. Heat the sauce on top of the stove until it darkens and looks like BBQ sauce. Pour it over the meatloaf and put it back on the grill or under the broiler until the glaze looks set. I serve it with roasted garlic and chives mashed potatoes. 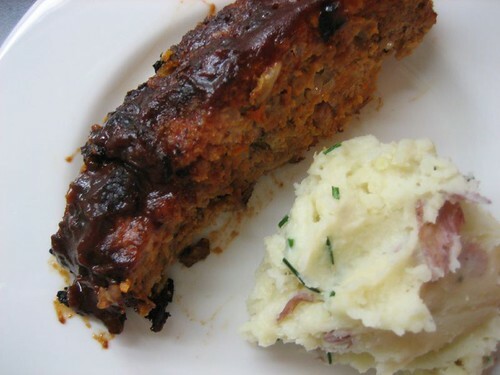 Make more than you need because this meatloaf is great the next day eaten cold or on a sandwich.